This is the supreme Yantra of the Divine Mother. All forms of Devi reside within. It creates a bubble of cosmic energy around the home where it is kept. Draws good luck, fortune, protection, blessings, money and spiritual powers. The Meru chakra is a three-dimensional Shree yantra. It can be effectively used for correcting defects of the north (direction of health, fortune and money) and northeast (energetically most important and most valuable area of the house). When placed in the northeast, it effectively improves the spatial energies of the whole house. Defects of spatial energy in the northeast and north are the most serious ones, so the Meru chakra is the most important corrective tool in Vastu. Calculated on the basis of the ancient Vedas its measurements and geometry embodies the creative potency of the universe Indian astrologers and Hindu priests can be seen advising people to keep this Yantra with them because of its self-active powers. Offering prayers before Shree Yantra also helps in the retrieval of blocked wealth. It is suggested to offer prayers in the form of "Shree Sookta" before the Shree Yantra. Blessed and Energized with proper Mantras, Puja's and Spiritually activated by SWAMI BUDHIRAJA to give best results. Since a Yantra or Mala is a Man-Made object, it requires energization to infuse potency and power to benefit the owner. Before sending the Yantras or Mala, we get Pran Pratishtha (Energization) done by learned Pandits (Priests) without any extra charges. This is done by reciting Mantras as prescribed by Vedas, as well as Homa for the respective Devi/Devta (God/ Goddess) as per Purpose of Yantra or Mala. ONLY WATER FROM RIVER GANGA (GANGES) IS USED FOR THE ENERGIZATION PURPOSE. SIZE: APPROX. 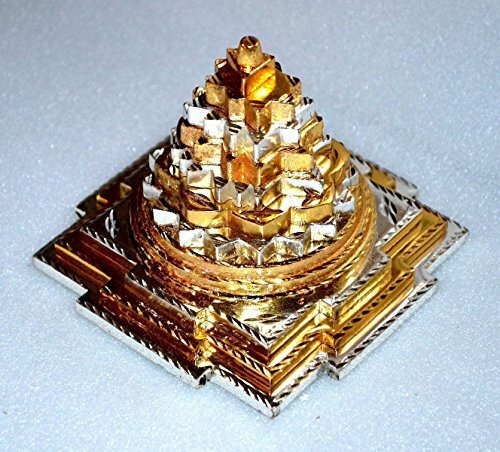 4"X4"; ASHTADHATU (MIX OF 8 METALS); GOLD PLATED; WEIGHT: 850 GMS APPROX. PLEASE NOTE: THERE ARE ALWAYS STAINS/SPOTS ON THE YANTRA BECAUSE OF THE RELIGIOUS CEREMONY (PUJA) WE PERFORM WITH WATER/MILK TO ENERGIZE THE YANTRA. If you have any questions about this product by Awaken Your Kundalini - For Genuine Gemstone Hand Knotted Japa Mala Beads Necklace & Bracelets, contact us by completing and submitting the form below. If you are looking for a specif part number, please include it with your message.